Today is the first Saturday of the month, which means it is time to explore another Italian wine region. Of course, it also the Fourth of July, so we bloggers tend to try to tie into the holiday theme. Hmm, should I talk about how Thomas Jefferson liked Italian wine? No, he like fine wine but was more of a Francophile. We are focusing on Lazio today, the region around Rome. The Founding Fathers were steeped in the Classics, and had an appreciation for things Roman. However, I don’t think we are looking for an American history lesson here. But the wine region of Lazio does have quite a history. The ancient Romans had a great appreciation for their local wine, and more often than not, it was Frascati in their glass. Well, when in Rome…so I followed the example of the ancients and had a Frascati for my #ItalianFWT post. Frascati is a white wine, made from at least 50% Malvasia grapes. Trebbiano made up the balance of the Massarosa Frascati we had. I didn’t get a chance to delve to deeply into Roman cuisine for this post. I simply thought about a dish that had some Italian flavor and that might go well with the Frascati. I was in the mood for pesto, so thought some orzo and pesto might go with the light style of the Frascati. 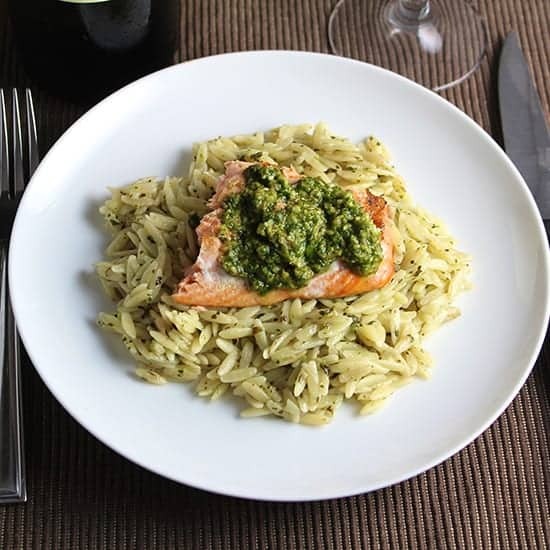 I added some salmon for protein, and came up with this tasty Orzo, Salmon and Pesto recipe. I like to grill salmon quite a bit in the warm weather, and so am always looking for different ways to serve it. 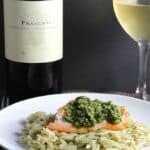 Pesto is definitely a good option to top the salmon, and also adds a nice flavor to the orzo. A winning combination! 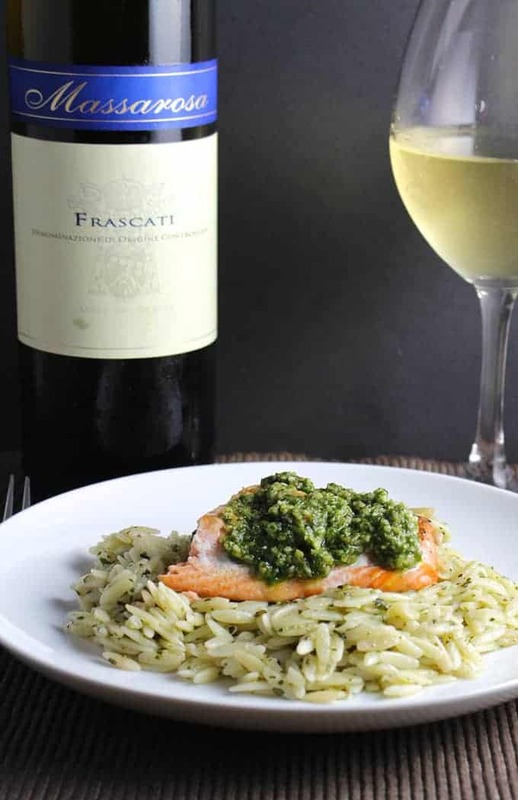 Wine Pairing: We had the 2012 Massarosa Frascati (13% alcohol, $13) with our Orzo, Salmon and Pesto. I wasn’t able to turn up much of anything on the producer on the web; I picked it because it was a better choice for pesto than the Merlot from Lazio they had in the shop. The Frascati has a lot of freshness on the nose–I get peach blossoms. Taste of ripe melon fruit. This is a light bodied wine, and keeps the food in the forefront. 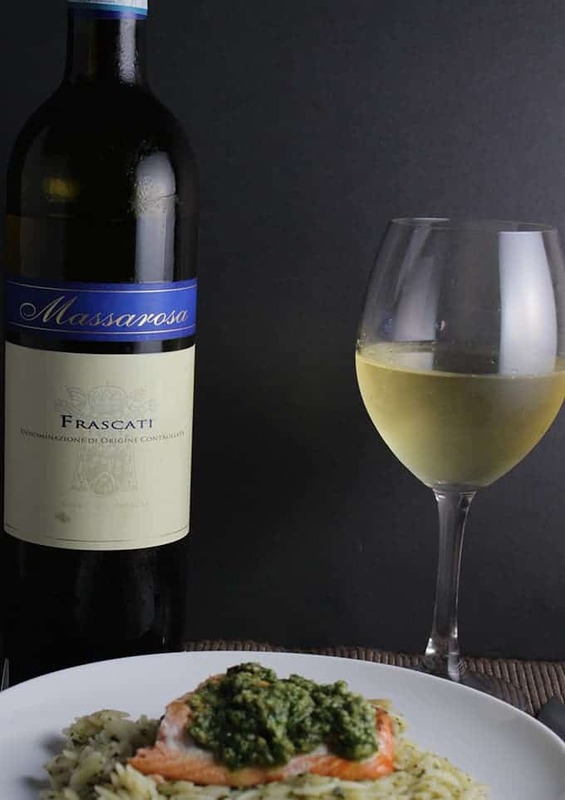 This Frascati goes well with the pesto, refreshing the palate and letting the tasty sauce shine. 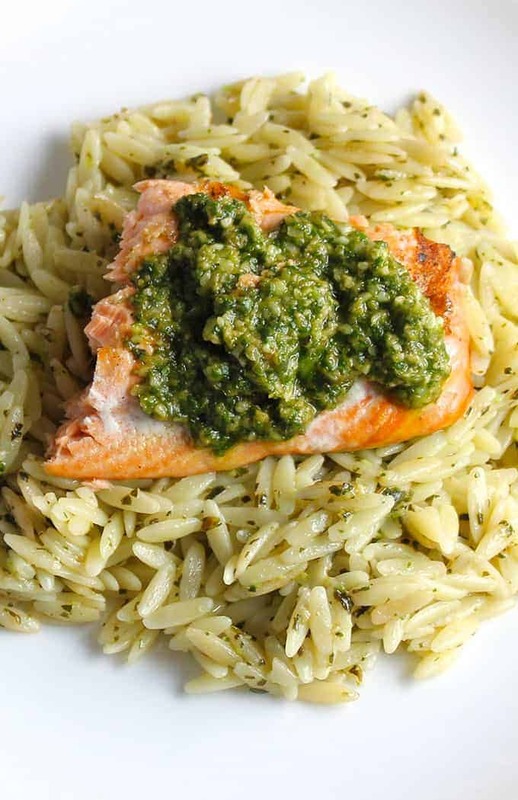 Grilled salmon gets served with orzo and pesto for a healthy and tasty summer meal. Make the pesto: Have a food processor at the ready. Put the basil into the food processor, and give it a quick whir to begin chopping the basil and make room for the other ingredients. Add the garlic, and hit that food processor button again to get the cloves chopped up with the basil. Add the remaining ingredients, and then puree to get everything well combined. Open the food processor, scrape the sides to get bits of garlic and basil that haven’t been incorporated, then give the processor a final whir. Cook the orzo according to package instructions after finishing the pesto. When the orzo is done, toss with a few tablespoons of the pesto so that the orzo is lightly coated. As the orzo cooks, rinse and pat dry the salmon fillet, then spread 1 tablespoon olive oil over the flesh side and sprinkle a bit of salt to taste. Place the salmon on the grill, skin side down. Grill covered for about 4 minutes, then gently turn the salmon to the flesh side. If the skin sticks to the grill, no big deal, just place the fish on a clean portion of the grill. Grill covered for another 3 to 4 minutes. It may be cooked at this point–cut a bit in the middle of the fillet to check. You still want a bit of the dark orange color for nice, moist salmon. If you want to cook a bit more, turn over one more time and cook for a couple more minutes. Remove the salmon to a platter when cooked to your liking. Plate a serving of the orzo, then place a portion of the salmon on top of the orzo. Spread a dollop of pesto on top of the salmon, and repeat for the other portions. Pass extra pesto for people to add more at the table, and enjoy with an Italian wine such as a Frascati. If you’re seeing this early enough make sure to join us live on twitter at 11am EST at #ItalianFWT. Tell us your food, wine or travel stories of Lazio. We look forward to chatting with you then. Next month on Saturday August 1st we’ll feature the island of Sardegna in Italy. Feel free to reach out to me and join us! Ciao ciao! Lovely!! Looks delish 🙂 Learning so much about wine pairing thanks to this post! A very refreshing dish! You always seem to combine some of my favorite foods salmon & pesto and on the grill to add. I’m not one for grilling fish, but I definitely need to try it more often because I do enjoy it. Just afraid of overcooking it I guess. You always seem to make everything look effortless and classic! Beautiful pairing again – looking forward to trying this the next time I cook or grill salmon! Happy 4th of July! Your dish looks fabulous David! I appreciate that your dishes are tasty AND healthy. I can totally see Frascati being a very good pairing with your dish. Cheers! What mushrooms are you talking about exactly? Save the whole bottle of wine until later. Hey Shawn–good catch! I do have some good recipes on Cooking Chat for salmon and mushrooms, and had used one of those instructions as the starting point for this mushroom-less recipe. Have now fixed, thanks. I really like it whenever peoplee get together and share thoughts. Made this yesterday but combined it with spinach, it was sooo delicious!!! That sounds like a good variation! Glad you liked it, Evelien.